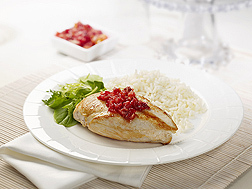 Garnishing chicken with cranberry chutney adds flavor and nutrients. Cranberries are rich in fiber and provide vitamin C and potassium. Maybe you remember when cranberries mostly showed up at year-end holidays as the perfect relish for your roast turkey. In the 1960s, however, the introduction of flavorful cranberry juice beverages helped build a new, year-round use for the berry. These pleasant blends balanced the cranberry’s naturally tart flavor with the sweetness of other favorite fruits such as apples and pears. In the 1990s, the launch of dried, sweetened cranberries, which look somewhat like little red raisins, brought new attention to the colorful fruit. Cranberries are rich in fiber, low in sodium, and provide vitamin C and potassium. They also contain intriguing natural compounds referred to as flavonoids, polyphenols, or, more generally, phytochemicals. Phytochemicals are of ongoing interest to nutrition and medical researchers worldwide. For instance, cranberry phytochemicals have been the focus of a series of studies by chemist Ronald L. Prior and colleagues. Formerly with the Agricultural Research Service at the Arkansas Children’s Nutrition Center in Little Rock, Prior is now an adjunct professor of food science at the University of Arkansas in Fayetteville. ARS scientists closely examined the types and amounts of interesting compounds in cranberry pomace (center), which is the stems, skin, and pulp left over after the berries are pressed to make juice or canned products. Cranberry Juice-Processing Leftovers: A Treasure Trove of Phytochemicals? In one investigation, Prior collaborated with Brittany L. White, formerly at the university and now a food technologist with ARS at Raleigh, North Carolina, and with Luke R. Howard, a professor in the university’s food science department, to closely examine the kinds and amounts of phytochemicals in cranberry pomace—the stems, skin, and pulp that are left when the plump berries are pressed to make juice or canned products. 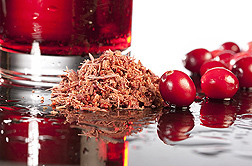 “Cranberry processors are looking for new, value-added uses of these byproducts,” says Prior. Knowing more about the polyphenols in pomace might lead to new ways to build new markets for it. Much is already known about the major polyphenols in fresh cranberries. But the Arkansas study is apparently one of the first to extensively investigate and document the kinds and amounts of major cranberry-pomace polyphenols. The researchers used several sophisticated analytical procedures, including high-performance liquid chromatography-electrospray ionization-mass spectrometry and matrix-assisted laser desorption time-of-flight mass spectrometry. These procedures can measure the molecular weight of pomace constituents and, from that, determine their identity. If appropriate reference standards are available, the quantity of each constituent can be determined. Among other findings, the scientists determined that the pomace contained “appreciable levels” of flavonols, a class of polyphenols that includes, for example, quercetin and myricetin. Fresh whole cranberries are already known to contain high levels of flavonols—more than most other berries and, in fact, more than most fruits or vegetables. But the research was the first to show that nearly half of the total flavonol content of whole berries was left behind in the pomace instead of making its way into juice. Published in the peer-reviewed Journal of Agricultural and Food Chemistry, the study is the most up-to-date analysis of its kind for cranberry pomace. The findings are a useful, readily accessible reference for medical and nutrition researchers, food processors, and others. A related investigation showed that the conventional procedure for gleaning polyphenols from pomace doesn’t fully extract proanthocyanidins, or PACs, an important class of polyphenols. The normal extraction process relies on a solution of acetone, acetic acid, and water. The team of White, Howard, and Prior examined an alternative approach—one that requires exposing pomace to various concentrations of sodium hydroxide at 140°F for 15 minutes. This method released 3 to 15 times more PACs than the traditional extraction method, according to the scientists. The team recommends using the traditional method first—to extract the more readily accessible polyphenols—then following that with the sodium hydroxide-based procedure to tackle the recalcitrant PACs. The sodium hydroxide method is not new. It is already used to recover polyphenols from rice, wheat, and corn, for instance. But the team is likely the first to show that the process works well for extracting cranberry PACs, too. More research is needed to determine what amounts of PACs are lost as a result of the sodium hydroxide treatment. In the meantime, researchers studying PACs in other plants might want to give the procedure a try. Cranberry PACs are of special interest because some research suggests that they may help counteract urinary tract infections. This role remains controversial, however. The scientists documented their research in the Journal of Agricultural and Food Chemistry and have applied for a patent for the sodium hydroxide-based process. Prior’s investigations of cranberry PACs has also included pinpointing what is perhaps the best available method for commercial labs around the globe to use to reliably determine the PAC content of cranberry products. Some currently available methods for measuring cranberry PACs either under- or overestimate the levels or pose other problems. Prior and colleagues at five different analytical labs on three continents determined that a quick, inexpensive test, the BL-DMAC (Brunswick Laboratories 4-dimethylaminocinnamaldehyde) assay, provided similar PAC results from one lab to the next. For this research, all of the participating labs were provided with the same set of 11 samples and a known standard as a reference. A peer-reviewed article in the Journal of the Science of Food and Agriculture tells more about the research.—By Marcia Wood, Agricultural Research Service Information Staff. This research is part of Human Nutrition, an ARS national program (#107) described at www.nps.ars.usda.gov. To reach the scientists mentioned in this article, contact Marcia Wood, USDA-ARS Information Staff, 5601 Sunnyside Ave., Beltsville, MD 20705-5129; (301) 504-1662. "Cranberries! Native Fruit’s Interesting Natural Compounds Investigated" was published in the August 2012 issue of Agricultural Research magazine.